From Ireland with grateful thanks? According to the BBC, the Republic of Ireland’s finances are €3.6bn better off as a result of an accounting error. 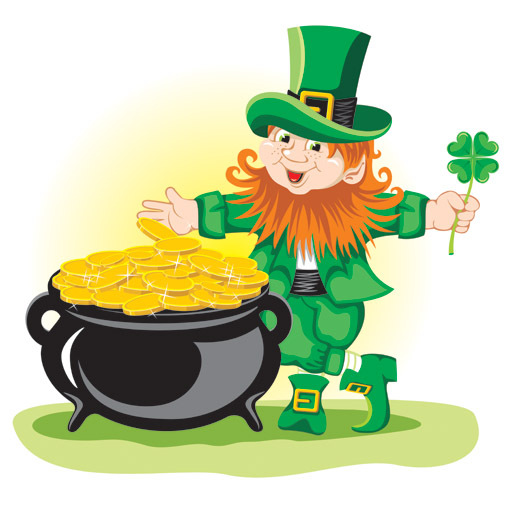 That’s the luck of the Irish for you! But then, when a country as small as Ireland can double count so much money is it any wonder they ended up needing an international bail out? Given that the UK provided Ireland with a £3.2bn bilateral loan at the end of 2010, and contributed a further £2.6bn through the UK’s participation in the EU’s stability mechanism, surely Dublin will be falling over themselves to reduce their debt and show their good faith by sending this money back to the UK taxpayers who funded it. After all, friendship goes both ways. No need for a grand ceremony or giant presentation cheque, a simple transfer of funds and a ‘thanks very much’ will suffice. Rejecting political parties: A sign of things to come? According to an opinion poll conducted by ‘Red C’, the candidates for Labour, Fine Gael and Sinn Fein are trailing in the wake of Irish ‘Dragon’s Den’ entrepreneur, Sean Gallagher. The former Fianna Fáil man is running as an independent and his stock is rising rapidly with Irish voters who are deserting the organised political parties. However not all is quite as it seems, as Gallagher is effectively running as an ‘arms length’ Fianna Fáil candidate. He is a mere Indeplastic – a cheap rip off of the real thing. That political party, knowing it would get short shrift from voters, does not have an official candidate and has decided the way forward is to get behind a proxy ‘celeb’ candidate. It is a sign of weakness. Clearly the penny is dropping in Ireland that the interests of the political parties are not the same as the electorate and that voting for the usual suspects doesn’t result in the changes they demand. Fianna Fáil are wise to it, but will others change tack too? If Gallagher wins the Presidency and takes up residence in the Áras it could signal the acceleration of the demise of political parties in Ireland. While that might be honey in the ears of the unelected bureaucratic dictators of the EU, it could see more people step up as genuine independent candidates – the kind of people who still want democracy and can’t be bought off by Brussels. One thing is clear in this political era, we are at a critical juncture and everything is to play for. The question is, are we up for the battle? As the international media became moist with excitement about the Osama Bin Laden story yesterday, the world continued to turn and events closer to home possessing a far greater impact on millions of people continued to develop. For while Osama Bin Laden went down fighting, AK-47 blazing away in his hand as he hid behind his wife, Ireland’s Minister of State for European Affairs, Lucinda Creighton, was busy confirming that country’s timid capitulation to the EU and running up a fresh, crisp white flag as she announced a special Europe Day would be held in the Dail. will begin a journey towards greater co-operation between the Government, the Oireachtas and the European institutions and will mark Ireland’s arrival back in the centre of European political and cultural life. Nail, hit, head. Synon’s piece is a must read. While the Irish people voted for change in their recent general election they got what we get here in Britain, more of the same. The faces and voices are different, but the hymn sheet is unchanged and the obeisance to Brussels remains. The political class may be made up of various political parties but their direction of travel is uniform. If you are part of a political group that seeks to restore independence then you’ve no chance. The wagons are duly circled and all the Europhiles direct their most bitter attacks and smears at you. In Ireland as in Britain, the political class is made up of interchangeable clones who put their career interests and the wishes of Brussels before the interests and wishes of the people who elect them to be representatives. Perhaps now those many Irish people who voted for Fine Gael because of the empty promise to renegotiate the vast loans that the European Central Bank has forced Ireland to accept, will come to understand that no matter who they vote for while they remain part of the EU, they are stuck with their true rulers in Brussels. 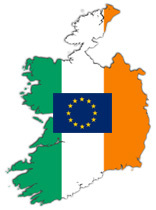 Only be extracting themselves from the EU will the Irish people enjoy self determination and genuine democracy. That is something far bigger and far more important for people than the execution of an Islamist homocidal maniac in Pakistan. The media loves a good yarn. The media’s attention deficit has seen them flit between coverage of nuclear armageddon in Japan and mortal combat in Libya without getting to the heart of the matter in either case. Take away their diagrams of nuclear reactor cooling ponds and images of fast jets and various armament options and there is precious little of value in the reporting. Usually so fond of providing ‘analysis’ there is a notable absence of thought about the long term effects of the destruction in Japan and what this might mean for the country and its government, or consideration about the potential for a change in the regional power dynamic in north Africa should Gadaffi be brought down by the Libyan rebels. The ‘mother and father’ of political and diplomatic battles is looming for Ireland as Finance Minister Michael Noonan goes into tomorrow’s eurozone ministers’ meeting in Brussels. He will seek to form a grand alliance of smaller European countries in our colossal battle with France and Germany to stop the “torturing” of Ireland and save its low corporation tax rate. And although taxation rates will not be on the agenda, Mr Noonan intends to use the occasion to build up a relationship with politicians from other countries in the 17 member eurozone. Bar some tinkering around the edges nothing will change. Ireland’s voters will still be paying higher taxes and experiencing huge cuts in spending on public services. They voted for change but will not see any, because when all is said and done the government of Ireland is cannot be found in the Dail, it resides in Brussels. No one was able to vote for or against it. But according to the Minister for Public Sector Reform Brendan Howlin, they accept the programme for government as long as the new administration agrees to raise the same amount of money from cuts and tax hikes. The Irish voted Fine Gael because of the promise to renegotiate the bailout. The bottom line? Nothing will change. The deckchairs can be re-arranged in the grand buildings where power once resided, but now that power has been handed over to the EU by the quisling politicians who put their own interest and prospects before the people they were supposed to serve, nothing that is said elsewhere means anything any longer. When reality finally dawns in the Free State one wonders if the people will remember the spin pumped out by the timid, establishment hangers on in the media who tried to keep the deception running. They are every bit as much to blame as the politicians they helped to bring this situation to pass. Since when has there ever been in history a centralising, power hungry, unaccountable entity that was benevolent and supportive? Since when has any entity stuffed to the gills with special interests, and dedicated to furthering the objectives of their barely visible establishment friends in the big corporations, ever undermined those interests? The Irish have delivered a savage verdict on those who turned their country from the envy of the world into an object of pity. In the process, they have smashed one of Europe’s great political machines, the Fianna Fáil party that enjoyed a near monopoly of power since 1932. This is a striking example of democracy at work. But does it matter? Voters damned Fianna Fáil’s disastrous decision to underwrite the staggering losses of grotesquely reckless banks. They are, however, stuck with those same policies in the shape of the deal made with the International Monetary Fund and the European Union. It ties the new government into ever-more brutal austerity for at least the next four years, while continuing to lavish public money on insolvent banks. It is all so confused it is difficult to know what on earth the Observer is trying to say. It seems to want to have its cake and eat it. The Observer lauds a ‘striking example of democracy at work’ on Ireland, but it believes totally in government by the anti democratic European Union. It refers to the ‘disastrous decision to underwrite the staggering losses of grotesquely reckless banks’, yet supported and pressed for the bail out of the banks with public money. It criticises the IMF and EU’s conditions for bailing out Ireland, yet ideologically supports such unaccountable internationalist bodies possessing such political and financial power to the detriment of nation states. There is more in the same vein. Surely the only conclusion any reasonable person can come to is that like so many in the media, the Observer is in utter denial, it is disconnected from reality, it is away with the fairies. Ireland’s voters have moved the deck chairs around and the faces in the government ministries will now change. But little else. Fine Gael will be the largest party in the Dail and form yet another coalition, and Enda Kenny is almost certain to be the new taoiseach. But beyond that, what difference will Ireland’s voters see? There is excited talk of Kenny starting the process of renegotiating the previous government’s 85bn-euro (£72bn) EU/IMF loan package. It is something that has echoes of David Cameron’s pledge to renegotiate the repatriation of power from Brussels to Westminster and is likely to have the same outcome. But then, what else do the Irish expect? Fine Gael actually helped Brian Cowen’s sinking government to put the Finance Bill to a vote in the Dail, supported some of its provisions and failed to stop the ones it opposed from passing. It is unrealistic in the extreme of Fine Gael to give the impression they will be able to change the terms of the expensive loan the EU and IMF put together. 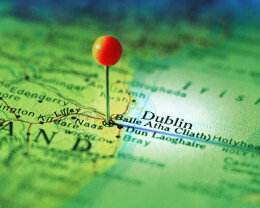 As Irish voters headed for the polling booths on Friday, the European Commission bluntly declared that the terms of the EU-IMF bailout “must be applied” whatever the will of Ireland’s people or regardless of any change of government. “It’s an agreement between the EU and the Republic of Ireland, it’s not an agreement between an institution and a particular government,” said a Brussels spokesman. A European diplomat, from a large eurozone country, told The Sunday Telegraph that “the more the Irish make a big deal about renegotiation in public, the more attitudes will harden”. “It is not even take it or leave it. It’s done. Ireland’s only role in this now is to implement the programme agreed with the EU, IMF and European Central Bank. Irish voters are not a party in this process, whatever they have been told,” said the diplomat. It will become apparent to the Irish people in the weeks and months that despite the campaigning, the voting and the time consuming counting they have changed precisely nothing, they are not a party in this process. It has been nothing more than a very expensive piece of theatre. The question that will then need to be asked is what will the Irish people do about it. Will they confirm their surrender, or will they again satisfy their hunger for independence? 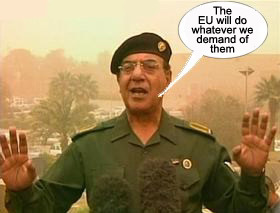 Take the €77 billion aid package. You’ve been told. Economic and political control of Ireland will reside in Brussels. You threw off British rule in 1922 (or 1932 depending on your perspective) and inexplicably gave up that hard won independence to be ruled by the EU. The Irish Republic – 1922-2010. When you are blinded by hatred it is sometimes difficult to see the wider picture. Bill Cash, the grand daddy of Tory Eurosceptics, gave a masterclass of this today when Downing Street confirmed that Britain may have to contribute to a possible bailout of the Irish Republic. Not a penny of British taxpayers’ money should go to bail out Ireland. Cash does not want to help the Irish Republic because it is a member of the eurozone. Ireland has only itself to blame, goes the Eurosceptic thinking, and should turn instead to the likes of France and Germany which enticed Dublin to join the single currency spurned by Britain. Oh piss off. Clearly Nicholas Watt is another idiot subscriber to the idea of the magic money tree that allows us to harvest vast quantities of cash on demand. Perhaps Watt needs a little (well actually a lot) help here. His spiteful and pejorative comments ignore a very simple fact. To help out Ireland the already heavily indebted UK would have to borrow even more money at a time we need to reduce public debt. Part of the supposed benefit of the Euro currency was that Eurozone members would support each other in times such as these. We are not a Eurozone member and we have our own problems to overcome. It is not any imagined hatred of Ireland as Watt disgracefully suggests which is at the heart of Bill Cash’s views, it is economic illiteracy of accepting we do not have enough money for our own needs yet borrowing billions on markets nervous of our debt levels to send to Ireland. The fact is if Cash’s comments had been made by a non-EUsceptic, Watt would not have written this piece. Think about it another way. Perhaps when the Unison trade union (currently hard at it recruiting new members) starts castigating the government for not spending more on its domestic departments, Watt will be happy to tell them it was more important to borrow money to send to Ireland rather than use it for the benefit of the UK. Realism and common sense are qualities notably absent from the Guardian. But if nothing else at least the Guardianista is always good for a bit of fantasy economics. The Irish High Court appears to have put an end to an outrageous abuse of power and affront to democracy by Ireland’s government. Brian Cowen’s government is so unpopular it has refused to hold by-elections in three Irish constituencies because it is set to lose all three seats. This would result in a loss of Cowen’s majority and his ability to pass legislation such as that to cut the Irish deficit. The case was brought by Sinn Fein because the Irish government has deliberately left the Donegal South West seat unrepresented for 17 months to avoid having another opposition TD (member of the Dail) voting against them. A judge in the High Court ruled today that the Irish government is violating the constitutional rights of voters by trying to delay the by-election in Donegal South West until next year. Cowen’s Chief Whip, John Curran, argued that Article 16.7 of the republic’s Constitution imposes no times limit for the holding of by-elections and so in a game of bureaucratic pass the parcel left the matter to the Oireachtas (national Parliament) which had not imposed any time limit in the legislation. Rather than ensure the people of Donegal South West (and the other two constituencies currently without representation) elected and sent their chosen elected representative to the Dail, the government put its own political interests first and ensured an election was not called. These are the kind of flagrant abuses of power that happen as democracy is eroded. With judicial competence being sucked into the centre of the EU, a neutered Irish High Court might in future be unable to address such issues. This is the world the political class have created and that ordinary people need to stand up against.